Frank Rawdin is one of the men named on the Bottesford ‘church list’ of WW1 servicemen. He was the fourth of seven sons of Thomas and Sarah Rawdin of Bottesford, five of whom served in WW1 following the oldest, also Thomas Rawdin, who served in the Boer War and won distinction in a heroic action earning him the epithet “The Hero of Nitral’s Nek”. In WW1, Robert, William, Frank Harry and Frederick Rawdin all joined the army, and four of them rose to be sergeants. Frank Rawdin was born in Bottesford on the 5th February, 1880, and baptised on the 25th April. His parents were Thomas Rawdin, born in 1848 in Bottesford, and Sarah Ann Lilley, born in 1851 also from Bottesford. In 1881, his father worked as a bricklayer and labourer and they lived at 1 The Green, Bottesford. At the time he was only 1 and had the following siblings: Ellen aged 11, Thomas aged 8, Robert aged 7, William (Henry) aged 5, Sarah E aged 3 and Arthur aged 3 months (census records; with additional information from the Farr and Brewin family trees on Ancestry). By 1891, the family had moved to 6 The Green, Bottesford, and his father had become a canal labourer. Though his brother Arthur died in 1882, Frank now had 3 more siblings: Harry aged 5, Rose L aged 3 and Frederick Cecil aged 1. In 1901 Frank Rawdin was working as a journeyman butcher for John D. Robinson at his shop on Market Street and was also living there. He married Mary Ann Margaret Timmis from Sibsey, near Boston, on the 21st July, 1905 at Sibsey. In the 1911 census, when he was 31 years old, he the couple lived at 31 Noel Street, Kimberley Nottingham, and had two children, 3 years old Frank Bernard and 1 year old Margaret Lilian. Frank was working as a brewer’s labourer and also shared his home with a boarder, Fred Judd, a fellow Brewing labourer. Interestingly, this census recorded Marry Ann as haling from Barnham Broom, Norfolk. Frank Rawdin’s military record has survived, although pages are damaged by the fire in WW2 and many are difficult to read. He attested in 1915 as a Territorial, Service Number 3844. His enlistment was completed on the 7th May, 2015, and served in the 2/8th Battalion of the Notts and Derbyshire Regiment (Sherwood Foresters), his service number 306189. At 5ft 5 inches he was not tall but passed his medical A1. In 1917 he saw rapid promotion from Lance Corporal in February 2017, to Corporal in April 1917, Lance Sergeant on the 8th May, 1917, to Sergeant on 19th May, 1917. In December 2017 he was posted home for 10 days. The 2/8th Battalion was part of the 139th Brigade, 42nd (North Midlands) Division in France. 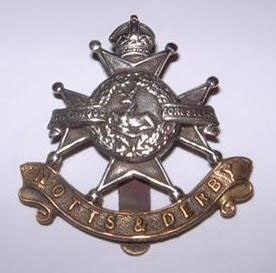 In October 1915, it took part in the attack on the Hohenzollern Redoubt, then at the end of the year had the odd experience of being sent to Egypt and then after a few days being recalled to rejoin the campaigns in France and Flanders including the diversionary attack on Gommecourt in June 1916. It saw active service in 1917 and 1918 specifically in the pursuit of the German retreat to the Hindenburg Line, Menin Road, Hill 70, Polygon Wood, Bourlon Wood & the German counter attacks of spring 1918. Frank appears to have been injured in his ankle and thigh in February 1918, and was shipped back to the UK for treatment, initially at Sandon Hall Hospital for the Wounded and then the Stoke on Trent Hospital, Staffordshire, through February and March 1918. His record shows that he spent 87 days in hospital. From 24th March 1918 to 2nd April 1918 he was granted furlough at his home, now 12 Noel Street, Kimberley, before being posted to 5 Reserve Battalion and 7 Reserve Battalion which were based in Saltfleet and Louth in Lincolnshire. His postings in the reserves continued through June and September 1918. When he left the army his certificate described his trade as a Brewers Foreman and that his health was A1. Frank Rawdin was awarded the British Medal and the Victory Medal. Frank was predeceased by his wife Mary Ann who died in 1937. In the 1939 register, he was recorded as a widower working as a brewery labourer, living at 25 Cliff Boulevard, Basford, Nottingham, with his son Frank, a brewery blacksmith, and his daughter Lucy. He died on 1st February, 1940, at the age of 59. In his probate record, it stated that he died at The Gables, Harlequin, Radcliffe on Trent, Nottinghamshire. His effects of £159 4s were to be administered by his son Frank Bernard Rawdin.